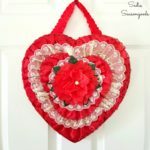 As I was going through my Valentine’s Day projects, I realized that every single one was red and/or pink. And while that’s not exactly shocking (it IS V-day, after all), I wanted to switch it up and go in an industrial decor or primitive decor direction using some heart shaped cake pans I found while thrifting. My plan? To create industrial / primitive style heart decorations! They were kind of icky (as old baking pans tend to get) but I wasn’t scared off. With visions of vintage Valentine chocolate boxes dancing through my head (like this one that I upcycled into a wreath), I wanted to create a more rustic / industrial (masculine?) version. This post contains affiliate links for your crafting convenience. 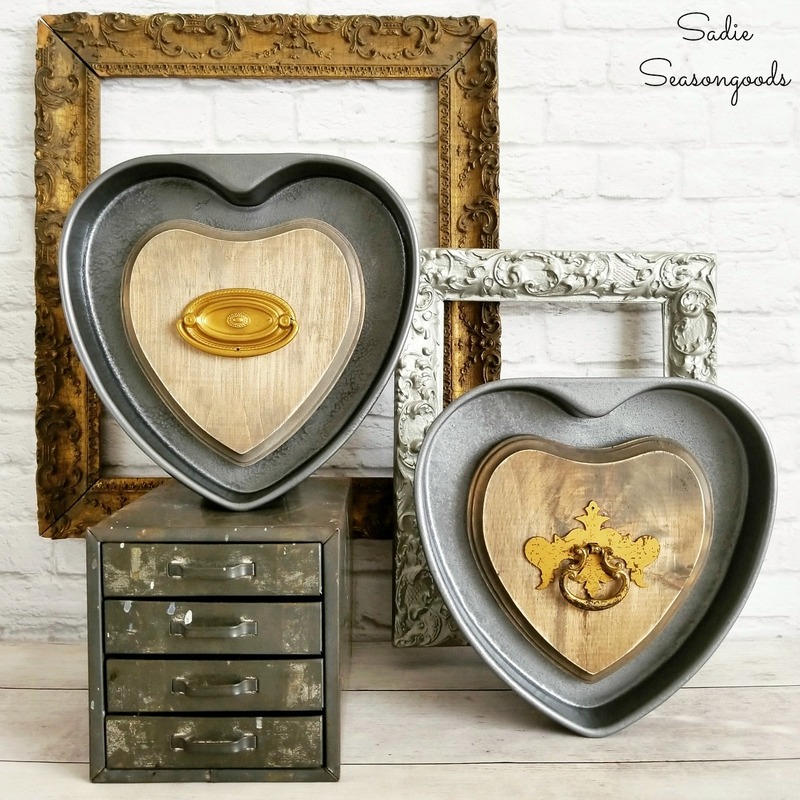 Here’s my vision: Inside the heart shaped cake pans, I’d layer in more industrial / rustic elements, starting with a wooden heart plaque. I found mine at a craft store, but it’s similar to this one. The final layer would include some of the dresser pulls I received from T4T Thrift Shop! They are one of my favorite thrift stores (and charitable organizations) and they sent a bag of hardware for my projects. Silly side note: The dresser pulls inspired a funny pun name for this project- I’ll share it at the end of this tutorial! So, let’s get to it. The first thing I did was drill two small holes in each of my heart shaped cake pans. This would allow me to attach the wooden heart plaques from the back of the pans with screws. Next, I spray painted the heart cake pans. Had they not been as icky-sticky as they were, I probably could have skipped this step. But a couple of light coats of my favorite spray paint for industrial decor seemed like a good way to “seal out” that grossness. While the paint dried, I drilled holes in the center of each wooden plaque that were big enough to stick the dresser pulls in. Then, I stained each plaque in one of my favorite wood stains (you may remember it from my French farmhouse decor post here). I let everything “cure” overnight and then lightly sanded the wood plaques again to lighten the edges for a little contrast. Then it was time to assemble my industrial style heart decorations! To keep it simple, I first super-glued the dresser pulls in/on the wooden plaques. Then, I attached the plaques to the heart shaped cake pans with screws. To keep the screws from being scratchy on walls or furniture, I cut out hearts in grey felt and stuck them to the undersides of each heart shaped cake pan using double-sided tape! And that was it- my version of frilly chocolate boxes in an industrial decor or primitive decor style! Let me tell you- my husband LOVES how they turned out. He joked that if it were a box filled with chocolates, he would have bought it right away. And maybe it’s a silly project, but it was a fun challenge to step away from red and pink decor for Valentine’s Day and go in a more rustic home decor direction. OH! That silly pun I was talking about. Well…I think these heart decorations should be called “Love Handles”. 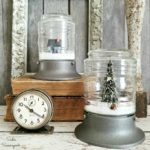 And if you’re looking for more industrial decor inspiration for the rest of the year, please check out my full collection of projects here! I love your non-red/pink hearts, Sarah! Wood & metal together are always a good marriage in my book! Love Handles is the perfect name for them! Thank you so much, Lora! Love them and love the cute pun. I Love the change and they are awesome. Love the decor and the pun was awesome. Great project Sarah, and I love the pun! Those are wonderful! Thanks for the link to the thrifty hardware, I need some to make a Potions book for Halloween using your tutorial! So cute! I love frilly more than industrial, but these were well done and would be so great in a industrial vibe setting. I like the idea of painting the cake pans to a uniform color; my real cake pans look a lot worse than those heart pans!